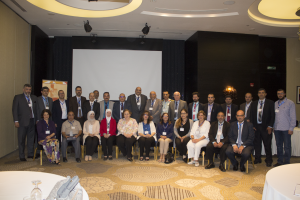 EMPHNET hosted the second MEDiterranean Public Health Alliance (MED – HEALTH) Stakeholders Meeting in Amman, Jordan on July 5, 2018. The meeting aimed at creating linkage and synergy between the project’s universities (Zarqa University and Mutah University) and main stakeholders in Jordan. Dr. Mohannad Al-Nsour, the Executive Director of EMPHNET, delivered the opening remarks whereby he reviewed outcomes of the first stakeholders meeting with a brief on the follow up efforts. 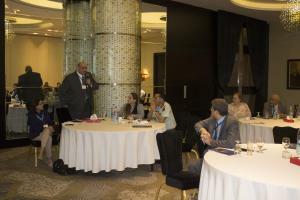 Keynotes of Dr. Al-Nsour’s remarks also focused on the sustainability of efforts in the long term. The representative of Erasmus + (Jordan Office) delivered a presentation on EU funded projects and their impact on higher education in Jordan, giving a special focus on the necessity to utilize and promote the mobility opportunities that are available for graduate and undergraduate students through these projects. Furthermore, representatives of Mutah University and Zarqa University provided an update on the new Public Health Management Masters program and shed light on the need to further promote the program to the community of practice, and hence increase the uptake of graduates in the local job market. 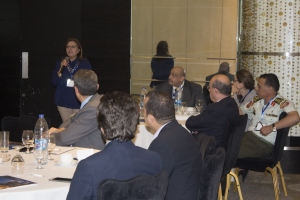 During the meeting, other presentations were delivered by representatives of Najah University and the Jordan Ministry of Health highlighting the public health education efforts, challenges, and inspirations within their respective institutions. The participants’ discussions covered different approaches to increase the public health sector attractiveness. They also agreed on the necessity to streamline awareness efforts among students and communities on public health both as a profession and an academic discipline.